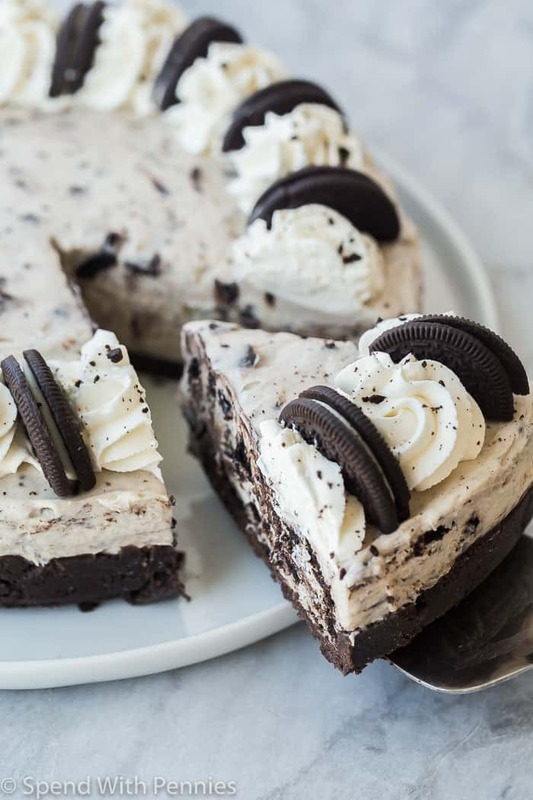 This No Bake Oreo Cheesecake is light, fluffy and creamy and loaded with Oreo chunks! Made with no oven and just a handful of ingredients! The sun is shining, the weather is getting warmer and it’s all about easy no bake desserts, especially no bake cheesecake, like No-Bake Lemon Cheesecake and No Bake Pumpkin Cheesecake! I don’t know anyone who likes having the oven going when it’s crazy hot outside! 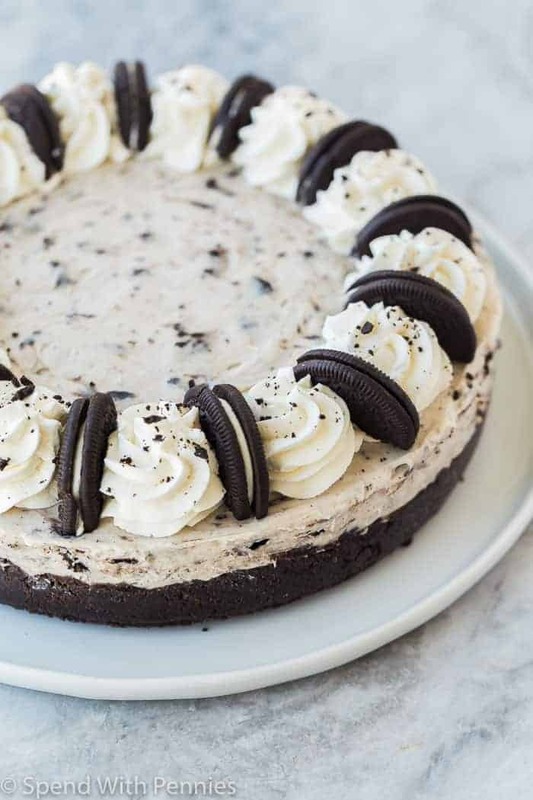 This No Bake Oreo Cheesecake is an easy no bake cheesecake recipe that takes basically no time to put together, and is gone in about the same amount of time. Whenever I make this homemade no bake cheesecake to take to a summer cookout or barbecue (or any other holiday dinner, any other time of the year), I don’t come home with leftovers. 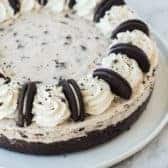 I’ll admit that I’m a little disappointed, but considering how easy this No Bake Oreo Cheesecake is to make, I know there will be another one in the fridge soon enough! Baked cheesecake can be a little fussy, but with no bake cheesecake, it’s just beat it until smooth and fluffy and chill. No overthinking and hardly any prep time! No Bake Chocolate Cheesecake – mmm, chocolate! Strawberry Cheesecake Pie – fresh strawberries! White Chocolate Raspberry Cheesecake – gorgeous AND delicious! Start with the crust: the crust here is a simple combination of Oreo cookie crumbs and melted butter. The melted butter is key to having a no bake crust that stays together, so don’t try to reduce it (unless you’re okay with a crumbly crust!). Make sure your cream cheese is room temperature. This ensures that it will whip up with no lumps. Beat everything together until smooth and then add in your whipping cream. When you add in your cream, make sure it is cold, and whip with an electric mixer until it is thick and fluffy. Don’t stop until you are getting stiff peaks and firm ridges are made by the beaters! Let it chill at least 6 hours, overnight is even better. This will help to ensure it slices nicely. 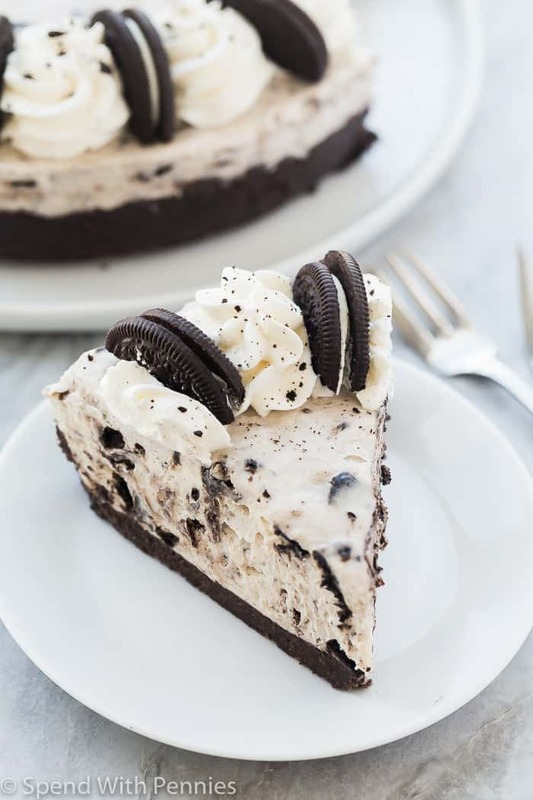 You can store this no bake Oreo cheesecake in the refrigerator for 3-4 days, keeping in mind that the crust will get softer the longer it is stored. It is best to make this cheesecake the day before you want to serve it. You can freeze this cheesecake too. Just keep in mind that as the cheesecake thaws and releases moisture, the crust will become less firm. If you wish to freeze it, I recommend serving it partially frozen as a cold and creamy summer dessert. Combine melted butter and 1 package of Oreo cookies in a food processor. Process until smooth and starts to stick together. Press into a 9″ Springform pan and about 1/2″ up the sides. In a medium bowl, combine white chocolate chips and 1/4 cup cream. Microwave on high in 20 second intervals, stirring well each time, until melted and smooth. Set aside. In a large bowl, beat cream cheese with an electric mixer until smooth. Add powdered sugar and melted white chocolate and beat until combined. Add remaining 1 cup cream, and beat on low until incorporated, then beat on high speed until thickened and fluffy (3-4 minutes). Reserve 5 Oreo cookies for garnish, and place the remaining 20 into a large zip-top bag. Crush with a rolling pin or other hard object and stir into cheesecake filling. Spread into prepared crust, cover, and chill for at least 5-6 hours or overnight. Slice and serve.